Did You Know ... Until this past decade, no Baylor athlete was known to have competed on a USA Basketball national team. However, in 2011 three Bears -- Brittney Griner, Odyssey Sims and Sophia Young -- changed that. While all three took part in the 2013 USA National Team’s October minicamp; Griner and Young played in the 2011 USA National Team’s European Tour and were members of the 2011-12 USA National Team; while Sims won a pair of World University Games gold medals in 2011 and 2013, and earned co-World University Games MVP honors in 2013. In 2014, Griner, who was named to the five-member All-FIBA World Cup Team, and Sims became the first Bears to compete at the top level internationally for USA Basketball as both were on the 2014 USA World Cup Team that captured the FIBA World Cup gold medal with a perfect 6-0 record and qualified the U.S. for the 2016 Olympic Games. Griner went on to claim gold at the 2016 Olympics and in the process, became the 10th player to have earned NCAA and WNBA titles and gold medals at the FIBA World Cup and Olympic Games. Head coach Kim Mulkey competed on her share of USA squads, including the 1984 U.S. Olympic Team that earned the gold medal in Los Angeles. In addition to her Olympic gold, Mulkey earned gold at the 1983 Pan American Games, 1984 R. William Jones Cup and 1981 U.S. Olympic Festival (South Team), while earning silver at the 1983 FIBA World Cup. Recent standouts Nina Davis (2015 World University Games), Alexis Jones (2011 and 2013 U19 World Cups, 2010 FIBA Americas U18 Championship) and Alexis Prince (2012 FIBA Americas U18 Championship) helped USA Basketball teams earn gold medals. International Invitational Title: 2017 U24 Four Nations Tournament. Member of the 2017 USA Women’s U23 National Team; averaged 9.7 ppg. and 5.0 rpg. to help the USA claim the inaugural U24 Four Nations Tournament Title with wins over Australia, Canada and host Japan in Tokyo. Participated in the 2015 USA U19 World Cup Team Trials. Took part in the 2014 USA U17 World Cup Team Trials. Member of the 2013 USA U16 National Team that captured the 2014 FIBA Americas U16 Championship gold medal with a perfect 5-0 record in Cancun, Mexico; averaged 7.6 ppg. and 6.2 rpg. to help the USA to a berth into the 2014 FIBA U17 World Cup. Gold Medal: 2014 FIBA U17 World Cup. Silver Medal: 2015 3x3 U18 World Cup. Teamed up with Kristine Anigwe, Erin Boley and Arike Ogunbowale to help lead the 2015 USA 3x3 U18 World Cup Team to an 8-1 record and the silver medal in Debrecen, Hungary. ; averaged 18.1 ppg. Participated in the 2014 USA Basketball U19 World Cup Team Trials. Teamed up with Kristine Anigwe, Asia Durr and Arike Ogunbowale on Defend, which won the 2015 USA 3x3 U18 National Tournament. Member of the 2014 USA U17 World Cup Team that captured the FIBA U17 World Cup with a perfect 7-0 record in Pilsen, Czech Republic. Aided the 2014 USA U17 squad to a 2-1 exhibition record in Nogent sur Seine, France. As a member of Defend in 2014, teamed with De’Janae Boykin, Napheesa Collier and Arike Ogwunbale to capture the 2014 USA Basketball 3x3 U18 National Tournament. Participated in the 2013 USA Basketball Women’s U16 National Team Trials. Honors: 2016 FIBA Americas U18 Championship MVP. Gold Medals: 2016 FIBA Americas U18 Championship, 2015 FIBA U19 World Cup, 2014 FIBA U17 World Cup, 2013 FIBA Americas U16 Championship. Member of the 2016 USA U18 National Team that finished with a perfect 5-0 record, earned the gold medal at the FIBA Americas U18 Championship in Valdivia, Chile, and qualified the USA for the 2017 FIBA U19 World Cup; named tournament MVP after averaging team-highs of 13.0 ppg. and 10.3 rpg. Member of the 2015 USA Basketball Women’s U19 World Cup Team that compiled a 7-0 record and captured the gold medal at the FIBA U19 World Cup in Chekhov, Russia; aided the 2015 USA U19 World Cup Team to a 3-0 record in exhibition play against U19 teams from Australia, Canada and Spain in Murcia, Spain. Member of the 2014 USA U17 World Cup Team that captured the gold medal with a perfect 7-0 record in Pilsen, Czech Republic. Recorded a double-double in the USA's gold medal-winning game against Spain, finishing with 20 points, including 4-for-4 from the free-throw line, 12 rebounds and a USA Women’s U17 single-game record eight blocked shots. Recorded a team-leading 19 total blocked shots to finish with a second-best average of 2.7 bpg. among all U17 competitors. Member of the 2013 USA U16 National Team that captured a gold medal with a perfect 5-0 record in the 2013 FIBA Americas U16 Championship in Cancun, Mexico, which earned the USA a berth into the 2014 FIBA U17 World Cup. Bronze Medal: 2015 FIBA Americas U16 Championship. Did You Know ... University of Buffalo head coach Felicia Legette-Jack is believed to be Buffalo's first connection to USA Basketball. Did You Know ... In 1996, former University of Connecticut star Rebecca Lobo became the first UConn player to win a medal at the Olympic Games when she helped the 1996 U.S. Women’s Olympic Team strike gold with an 8-0 record in Atlanta. Since that time eight Huskies have won a combined 17 gold medals at the Olympic Games, including Sue Bird (2016, 2012, 2008, 2004), Swin Cash (2012, 2004), Tina Charles (2016, 2012), Asjha Jones (2012), Maya Moore (2016, 2012), Breanna Stewart (2016), Diana Taurasi (2016, 2012, 2008, 2004) and Kara Wolters (2000). Eight UConn athletes also have represented USA Basketball at FIBA World Cups, including 2010 and 2014 USA World Cup gold medalists Bird, Charles, Moore and Taurasi; 2010 gold medalists Cash and Jones; and 2014 gold medalist Stewart. Bird and Taurasi were members of the 2006 USA squad that returned with a bronze medal, Bird captured her first FIBA Worlds gold in 2002 and Wolters was on the ‘94 squad that took the bronze medal and the ‘98 team that won gold. 2009-16 USA National Team head coach Geno Auriemma first coached for USA Basketball in 1993. Among his numerous coaching stints with the red, white and blue was as an assistant coach for the 2000 U.S. Olympic Team that won gold in Sydney. More recently, Auriemma piloted the 2010 and 2014 USA World Cup and 2012 and 2016 U.S. Olympic teams to gold medals. In addition to its nine Olympic gold medalists and eight World Cup gold medalists, UConn’s all-time roster is filled with numerous USA Basketball Junior National Team gold medalists, including recent graduates Moriah Jefferson, Stewart and Morgan Tuck, who won a combined 11 gold medals and two silver medals competing on various USA Basketball junior teams. Not only is UConn prevalent among USA athlete rosters, three former Huskies have joined the USA Basketball coaching ranks. In 2017 Carla Berube served as a head coach for the 2017 USA U16 National Team that captured the gold medal with a perfect 5-0 record and qualified the U.S. for the 2018 FIBA U17 World Cup. 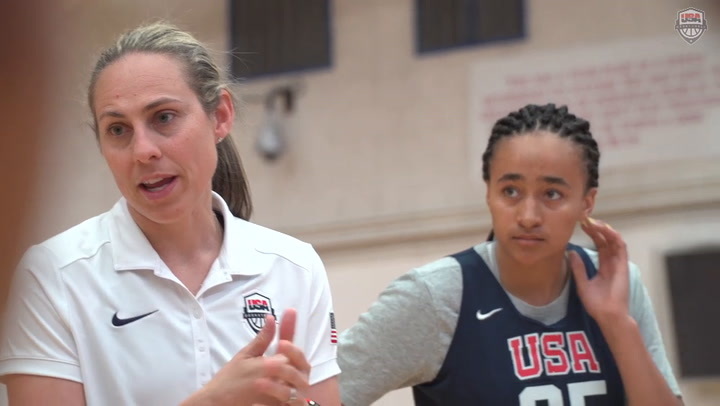 Jamelle Elliott twice has served as a court coach, both at the 2016 Olympics and the 2017 USA U23 National Team training camp, while Jennifer Rizzotti has been a head and assistant coach for numerous USA teams and most recently was a court coach for the 2017 USA National Team training camp that featured eight current and former Huskies on the roster. Rizzotti is scheduled to return to USA Basketball in 2018 as an assistant coach for the USA National Team through the FIBA World Cup. UConn also lists four USA Basketball Female Athlete of the Year honorees in Charles (2009), Moore (2014), Stewart (2011, 2013) and Taurasi (2006, 2010, 2012, 2016). Honors: 2015 FIBA U19 World Cup All-Tournament Team. Gold Medals: 2015 FIBA U19 World Cup, 2014 Youth Olympic Games, 2014 FIBA Americas U18 Championship. Member of the 2017-20 USA Basketball Women's National Team. Participated in the 2017 USA Basketball Women’s National Team training camp Sept. 30-Oct. 2 in Santa Barbara, California. Member of the 2015 USA Basketball Women’s U19 World Cup Team that compiled a 7-0 record and captured the gold medal at the FIBA U19 World Cup in Chekhov, Russia. Aided the 2015 USA U19 World Cup Team to a 3-0 record in exhibition play against U19 teams from Australia, Canada and Spain in Murcia, Spain. Helped the 2014 USA Youth Olympic Games Team capture a gold medal with a 13-0 record at the Youth Olympic Games, played using FIBA’s 3x3 rules, in Nanjing, China. Member of the 2014 USA U18 National Team that captured the gold medal with a perfect 5-0 record at the 2014 FIBA Americas U18 Championship in Colorado Springs, Colorado, which qualified the U.S. for the 2015 FIBA U19 World Cup. Gold Medals: 2015 FIBA U19 World Cup, 2013 FIBA Americas U16 Championship. 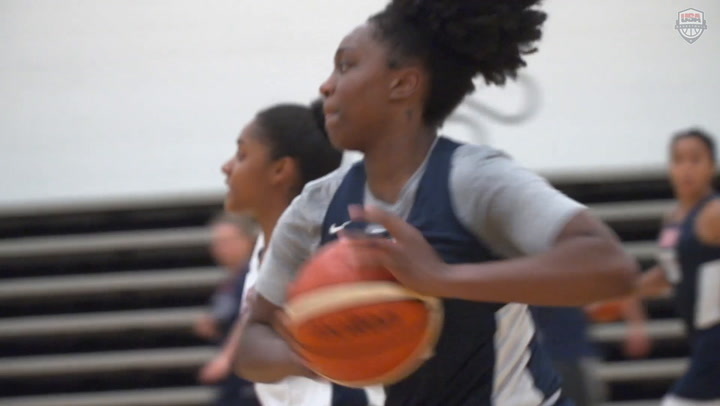 Is one of five U.S. athletes who have played on two USA U19 World Cup Teams, joining Alexis Jones (2011, 2013), Breanna Stewart (2011, 2013), Morgan Tuck (2011, 2013) and A'ja Wilson (2013, 2015). Named to the 2016 USA U18 National Team, but withdrew due to injury. Member of the 2015 USA U19 World Cup team that captured the gold medal with a 7-0 record at 2015 FIBA U19 World Cup in Chekhov, Russia; helped the USA U19 team to a 3-0 record in exhibition play against U19 teams from Australia, Canada and Spain in Murcia, Spain. Participated in the 2014 USA U17 World Cup Team trials. Member of the 2013 USA U16 National Team that won gold with a perfect 5-0 record at the FIBA Americas U16 Championship in Cancun, Mexico, and qualified the USA for the 2014 FIBA U17 World Cup. Honors: 2014 FIBA U17 World Cup All-Tournament Team. Gold Medals: 2014 Youth Olympic Games, 2014 FIBA U17 World Cup, 2013 FIBA Americas U16 Championship. Participated in the 2017 USA U23 National Team training camp July 31-Aug. 4 in Colorado Springs, Colorado. Helped the 2014 USA Youth Olympic Games Team, played using FIBA’s 3x3 rules, capture a gold medal with a 13-0 record in Nanjing, China; missed six games due to an ankle injury. Member of the 2013 USA U16 National Team that won gold with a perfect 5-0 record at the FIBA Americas U16 Championship in Cancun, Mexico, and qualified the U.S. for the 2014 FIBA U17 World Cup. Gold Medal: 2015 FIBA U19 World Cup. Silver Medals: 2017 FIBA U19 World Cup, 2016 FIBA 3x3 U18 World Cup. Honors: 2016 FIBA 3x3 U18 World Cup All-Tournament Team. Member of the 2016 USA U18 National Team that captured the gold medal with a perfect 5-0 record at the FIBA Americas U18 Championship to qualify the USA for the 2017 FIBA U19 World Cup. Teamed up with Jaelyn Brown, Sidney Cooks and Amber Ramirez to win the 2016 USA Basketball 3x3 U18 National Tournament, which qualified them to represent USA Basketball at the 2016 FIBA 3x3 U18 World Cup, where they earned the silver medal in Astana, Kazakhstan, with a 5-2 record. Did You Know ... Duke University has seen many of its players and head coach on USA Basketball rosters. Most notable among them is Alana Beard, a member of the 2006 USA World Cup Team that went 8-1 and captured the bronze medal. Beard also won gold at the 2003 FIBA U21 World Championship, bronze at the 2001 FIBA U19 World Cup and gold at the 2000 FIBA Americas U18 Championship. For her stellar play, Beard was named to the five-member FIBA all-tournament teams in both the ‘01 Junior Worlds (U19) and the ‘03 Young Women Worlds (U21). Joining Beard on the U19 squad were Monique Currie, who captured gold with the 2005 USA World Unviersity Games Team, and Wynter Whitley. Tricia Liston captured a gold medal at the 2013 World University Games; Iciss Tillis was a member of the 2003 USA Pan American Games Team that collected the silver medal in the Dominican Republic; both Jasmine Thomas and Krystal Thomas were members of the 2007 USA U19 World Cup Team that captured gold; Abby Waner earned three gold medals, including at the 2004 FIBA Americas U18 Championship, 2005 FIBA U19 World Cup and 2007 FIBA U21 World Championship; and Elizabeth Williams, the 2009 FIBA Americas U16 Championship MVP, captured gold medals at the 2011 FIBA U19 World Cup, 2010 FIBA U17 World Cup and 2009 FIBA Americas U16 Championship. Lindsey Harding was named to USA National Team in 2007 and played in various exhibition games for the national team through 2010, when she was a finalist for the USA World Cup Team. Harding also participated in the USA National Team minicamp in October 2013 and was a member of the 2014-16 USA Women’s National Team. Recent Duke standouts Oderah Chidom earned gold at the 2012 FIBA U17 World Cup, and Kendall Cooper captured a gold medal at the 2012 FIBA Americas U18 Championship. Member of the 2015 USA U16 National Team that captured the bronze medal with a 4-1 record in Pueblo, Mexico. Gold Medal: 2012 FIBA Americas U18 Championship. Member of the 2012 USA U18 National Team that captured gold with a perfect 5-0 record at the 2012 FIBA Americas U18 Championship in Gurabo, Puerto Rico. Honors: 2011 FIBA Americas U16 Championship co-MVP. Gold Medals: 2012 FIBA U17 World Cup, 2011 FIBA Americas U16 Championship. Honorary Bronze Medal: 2011 FIBA U18 3x3 World Cup. Member of the 2012 USA U17 World Cup Team that captured the gold medal with a perfect 8-0 record in Amsterdam, the Netherlands. Teamed up with Kaela Davis, Linnae Harper and Taya Reimer on the 2011 USA 3x3 U18 World Championship Team that took home an honorary bronze medal after an impressive effort in the final day’s games at the inaugural FIBA U18 3x3 World Cup in Rimini, Italy. Approximately one-and-a-half minutes into the USA’s semifinal game against host Italy, the U.S. squad was reduced to two healthy players and battled into overtime before succombing by just two points. Slated to play Japan in the bronze medal game, but listing just two available athletes, the USA was forced to forfeit due to injury and technically finished fourth. However, FIBA recognized the USA's effort and awarded the team honorary bronze medals. Averaged 5.0 ppg. over the USA 3x3 U18 team’s eight games. Member of the 2015 USA Basketball U16 National Team that captured the bronze medal with a 4-1 record at the 2015 FIBA Americas U16 Championship in Puebla, Mexico. Did You Know ... Louisville boasts 2010 and 2014 FIBA World Cup and 2012 and 2016 Olympic gold medalist Angel McCoughtry among its all-time roster. McCoughtry, who first donned a USA Basketball uniform in winning gold at the 2007 Pan American Games, received her first USA National Team nod in 2009. Recent Louisville standouts Sara Hammond and Bria Smith also took home gold medals from international competitions. Hammond as a member of the 2014 USA 3x3 World Cup Team and Smith at the 2010 FIBA U17 World Cup. Additionally, Shoni Schimmel captured a gold medal as a member of the 2013 USA World University Games Team, while Cardinals head coach Jeff Walz took on his first USA Basketball coaching assignment as an assistant coach for the 2014 USA U18 National Team that finished 5-0 and in possession of the FIBA Americas U18 Championship gold medal. The team qualified USA Basketball for the 2015 FIBA U19 World Cup, and Walz served as an assistant coach for the USA U19 World Cup Team that also claimed gold. This past year Walz was head coach of the 2017 USA U23 National Team that captured the inaugural U24 Four Nations Tournament championship in Tokyo, and returned as a court coach for the 2017 USA Basketball Women’s National Team training camp Sept. 30-Oct. 2 in Santa Barbara, California. Totals 18-0 2 Gold Medals, 2 International Tournament Titles. Honors: 2013 FIBA Americas U16 MVP. Gold Medals: 2014 FIBA U17 World Cup, 2013 FIBA Americas U16 Championship. International Invitationals: 2017 U24 Four Nations Tournament (first place). Is 17-1 in USA Basketball games played. Member of the 2017 USA Women’s U23 National Team; averaged a team-leading 12.7 ppg. and 2.3 rpg. to help the USA claim the inaugural U24 Four Nations Tournament Title with wins over Australia, Canada and Japan in Tokyo. Named to both the 2015 USA 3x3 U18 World Cup Team and 2015 USA U19 World Cup Team, but was injured and unable to compete. Teamed up with Kristine Anigwe, Natalie Chou and Arike Ogunbowale on Defend, which won the 2015 USA 3x3 U18 National Tournament. Member of the 2013 USA U16 National Team that won gold with a perfect 5-0 record at the FIBA Americas U16 Championship in Cancun, Mexico, and qualified the U.S. for the 2014 FIBA U17 World Cup; averaged a tournament-best and USA U16 record 18.4 ppg., also set USA U16 records for field goals made (31), free throws made (19) and free throws attempted (26). Member of the 2016 USA U18 National Team that finished with a perfect 5-0 record, earned the gold medal at the FIBA Americas U18 Championship in Valdivia, Chile, and qualified the USA for the 2017 FIBA U19 World Cup; dished out a USA third-best 3.4 apg. Did You Know ... It is believed that Teaira McCowan is the first Mississippi State athlete to compete for USA Basketball. Gold Medal: 2014 FIBA Americas U18 Championship. Did You Know ... Former Notre Dame star Ruth Riley became Notre Dame’s first women’s basketball Olympian in 2004. Riley, who trained and competed with the 2004 USA Basketball National Team in Cuba and Europe, originally was named as an alternate for the 2004 U.S. Olympic Team. However, following an injury to DeLisha Milton-Jones, Riley was called up to the squad and collected a gold medal in Athens. A member of the 1998 USA Select Team that competed against national teams in Puerto Rico, Poland and Spain, Riley also competed on the 1999 silver-medal winning USA Women’s World University Games Team. A number of other Notre Dame athletes have donned the red, white and blue. Members of the 2017-20 USA National Team, Kayla McBride and Skylar Diggins suited up for the USA National Team minicamp in October 2013, were named to the 2014-16 USA National Team in January 2014 and were finalists for the 2014 USA World Cup Team. Prior to that, Diggins won five gold medals in various events, notably at the 2009 FIBA U19 World Cup and 2012 FIBA 3x3 World Cup. Another gold medal for Diggins came when she teamed with Natalie Novosel at the 2011 World University Games, while McBride earned gold at the 2010 FIBA Americas U18 Championship. Recent standout Jewell Loyd captured a pair of gold medals playing for USA Basketball at the 2014 FIBA 3x3 World Cup and 2010 FIBA U17 World Cup, and is also a member of the USA National Team. Further, associate coach Beth Cunningham earned gold at the 1997 World University Games, silver at the 1997 FIBA Americas Champoinship and was a member of the 1999 USA Pan American Games Team that captured bronze; while Carol Owens as a coach helped four USA teams claim gold at FIBA and FIBA Americas events. Recent grads Michaela Mabrey helped the 2012 USA U18 National Team capture gold at the FIBA Americas U18 Championship and Lindsay Allen aided the USA to gold at the 2012 FIBA U17 World Cup. Gold Medals: 2014 Youth Olympic Games, 2014 FIBA U17 World Cup, 2013 FIBA 3x3 U18 World Cup, 2013 FIBA Americas U16 Championship. Silver Medal: 2015 FIBA 3x3 U18 World Cup. Tournament Title: 2017 U24 Four Nations Tournament. Member of the 2017 USA Women’s U23 National Team and averaged 8.3 ppg. and 3.0 rpg. to help the USA claim the inaugural U24 Four Nations Tournament Title with wins over Australia, Canada and Japan in Tokyo. Teamed with Kristine Anigwe, Natalie Chou and Erin Boley on the USA 3x3 U18 World Cup Team that compiled a 8-1 record and took home the silver medal from the 2015 FIBA 3x3 U18 World Cup in Debrecen, Hungary. Teamed up with De’Janae Boykin, Napheesa Collier and Katie Lou Samuelson and helped the 2014 USA Youth Olympic Games Team capture a gold medal with a 13-0 record at the Youth Olympic Games, played using FIBA’s 3x3 rules, in Nanjing, China. Member of the 2014 USA U17 World Cup Team that captured the FIBA U17 World Cup with a perfect 7-0 record in Pilsen, Czech Republic; aided the 2014 USA U17 squad to a 2-1 exhibition record in Nogent sur Seine, France. Member of the 2013 USA 3x3 U18 World Cup Team that won a gold medal at the 2013 FIBA 3x3 U18 World Cup with an 8-1 record alongside Gabby Green, Samuelson and Brianna Turner. Gold Medals: 2014 FIBA Americas U18 Championship, 2013 FIBA U18 3x3 World Cup, 2013 FIBA U19 World Cup, 2012 FIBA 3x3 U18 World Cup, 2012 FIBA U17 World Cup. Teamed up with Gabby Green, Arike Ogunbowale and Katie Lou Samuelson on the 2013 USA 3x3 U18 World Cup Team that captured the FIBA U18 3x3 World Cup gold medal with an 8-1 record in Jakarta, Indonesia. Member of the 2013 USA Basketball U19 World Cup Team that posted a perfect 9-0 record and captured the gold medal at the 2013 FIBA U19 World Cup in Lithuania; aided the USA U19 squad to a 3-0 exhibition record against U19 teams from Australia, Canada and Spain in the Canary Islands. Member of the 2012 USA 3x3 U18 World Cup Team that posted a 7-1 record en route to the gold medal in Alcobendas, Spain. The team’s lone loss came against China in overtime with only two players available in the extra period. Member of the 2012 USA U17 World Cup Team that captured the FIBA U17 World Cup gold medal with a perfect 8-0 record, shot a team second-best 56.9 percent (29-51 FGs) from the floor; prior to the U17 Worlds, helped the U.S. to a 4-0 exhibition slate with wins over U17 teams from Australia, Brazil and Italy. Did You Know? ... Four Oregon players have competed for USA Basketball. Jenny Mowe helped the U.S. capture gold at the 1997 FIBA Junior (U19) World Cup in Natal, Brazil; Stacy Wallenborn (1991) and Sara Wilson (1993) both collected bronze medals for the USA at the R. William Jones Cup in Taipei, Taiwan; and Shaquala Williams earned a gold medal with the 2001 USA World University Games Team in Beijing, China. Took part in the 2017 USA Basketball 3x3 National Tournament, where she helped lead the Ducks to a 5-2 record and a runner-up finish. Member of the 2016 USA U18 National Team that captured the gold medal with a perfect 5-0 record at the FIBA Americas U18 Championship to qualify the USA for the 2017 FIBA U19 World Cup; started two of three games played and averaged 8.0 ppg. and 6.3 rpg. Took part in the 2014 USA Women’s U17 World Cup Team Trials. Member of the 2017 USA Women’s U23 National Team; averaged 10.3 ppg. and 2.7 rpg. to help the USA claim the inaugural U24 Four Nations Tournament Title with wins over Australia, Canada and Japan in Tokyo. Did You Know ... Oregon States boasts one Olympic gold medalist in Carol Menken-Schaudt, who helped lead the USA to its first Olympic women’s basketball gold in 1984. She also collected a gold medal at the 1983 World University Games after earning a silver medal at the 1981 World University Games. 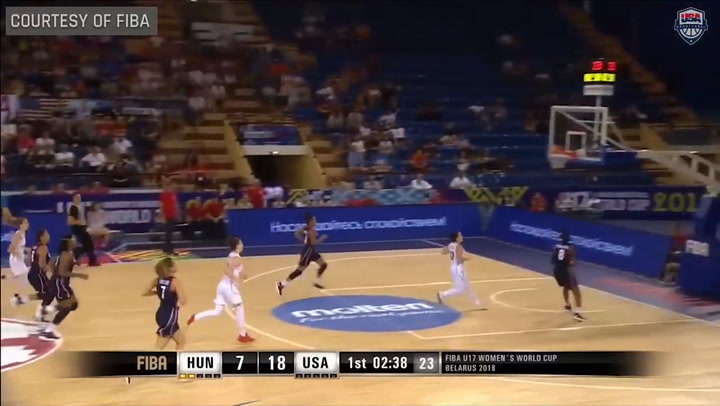 More recently, Sydney Wiese, a member of the 2017-20 USA Basketball Women's National Team, helped lead the 2015 USA World University Games Team to gold. Did You Know ... Shannon ‘Pee Wee’ Johnson lists as the lone Olympian on South Carolina’s all-time roster. After playing on four junior national teams from 1993-97, Johnson was called up to the USA National Team in 1998. She competed in several tours and exhibitions before landing a spot on the 2002 USA World Cup Team. She played back-up at the 2002 Worlds and 2004 Olympic Games to current head coach Dawn Staley and won gold medals in both events. After a storied USA Basketball career hat spanned 15 years, included three Olympic gold medals, two FIBA World Cup gold medals and a FIBA World Cup bronze medal, Staley, who was chosen by her peers as the 2004 U.S. Olympic Team flag bearer for the Opening Ceremony, retired from international basketball as an athlete. However, two years later she returned and was an assistant coach for the 2006-08 USA National Team. During that time, the U.S. won the 2008 Olympic and 2007 FIBA Americas Championship gold medal and returned from the 2006 FIBA World Cup with the bronze medal. She also served as the head coach for the gold medal winning 2007 USA Pan American Games Team and was a court coach for the 2013 USA National Team minicamp in Las Vegas in October 2013. The summer of 2014 saw Staley pull double duty, first as head coach for the USA U18 National Team that featured Gamecock A’ja Wilson, won the FIBA Americas U18 Championship and qualified the USA for the 2015 FIBA U19 World Cup, and she followed that up as an assistant coach for the 2014 USA World Cup Team that won gold and qualified the U.S. for the 2016 Olympic Games. In 2015, Staley aided the USA National Team to a 4-0 record in Europe against three professional teams in Czech Republic, Italy and Spain and the Italian National Team. She then served as an assistant coach to the 2016 U.S. Olympic Team that claimed gold in Rio de Janeiro. Named on March 20, 2017, as the 2017-20 USA Basketball Women’s National Team head coach, Staley will remain on the USA Basketball sideline through 2020. Recent USC standouts who have donned the red, white and blue include Alaina Coates, who earned a silver medal at the 2015 Pan American Games, three-time USA Basketball gold medalist Kaela Davis and Tiffany Mitchell, who won a gold medal at the 2014 FIBA 3x3 World Cup, a silver medal at the 2015 Pan American Games and was on the 2016 USA Select Team that played an exhibition game against the 2016 USA National Team prior to the Olympic Games. Totals 81-4 (.953) 7 gold medals, 1 bronze medals, 3 tournament titles, 1 second-place finish. Bronze Medal: 2016 FIBA 3x3 World Cup. Teamed up with Linnae Harper, Natalie Romeo and Chatrice White to form the 2016 USA Women’s 3x3 World Cup Team that returned from China with a 5-2 record and bronze medal; ranked third among tournament leaders for points scored with 46 (6.6 ppg.) over seven games. Honors: 2015 FIBA U19 World Cup MVP, 2014 FIBA Americas U18 Championship MVP. Gold Medals: 2015 and 2013 FIBA U19 World Cups, 2014 FIBA Americas U18 Championship. Named to the 2017 USA U23 National Team, but was injured and withdrew from the team. Averaged a USA-high and ranked second among the 16-team field for scoring (18.3 ppg. ), while ranking seventh in the tournament for field goal percentage (.495) and eighth in rebounding (8.4 rpg.) en route to earning 2015 FIBA U19 World Cup MVP honors. Member of the 2013 USA Basketball U19 World Cup Team that posted a perfect 9-0 record and captured the gold medal at the 2013 FIBA U19 World Cup in Lithuania. Did You Know ... Former Stanford University standout Jennifer Azzi was a member of the gold medal winning 1996 U.S. Olympic Team and also helped lead the 1990 and 1998 USA World Cup teams to the gold medal and the 1994 squad to bronze. Azzi and Katy Steding competed together as members of the 1996 U.S. Olympic Team that was coached by Tara VanDerveer. VanDerveer has coached at every competitive level on behalf of USA Basketball, and was head mentor of both the historic 1995-96 USA Basketball Women’s Senior National Team, which compiled a 52-0 record, and the gold medal winning 1996 USA Olympic Team. Jayne Appel, Sonja Henning and Nnemkadi Ogwumike also competed for USA Basketball at the FIBA World Cup, Appel claiming gold in 2010, Henning teamed up with Azzi for gold in 1990 and Nneka Ogwumike was a member of the gold medal winning 2014 USA World Cup Team. Nneka’s sister Chiney Ogwumike, who was a finalist for the 2014 USA World Cup Team and a member of the 2014-16 USA National Team, won three gold medals playing for USA Basketball. Chiney Ogwumike captured gold at the 2010 FIBA Americas U18 Championship, 2011 World University Games and in the inaugural FIBA 3x3 World Cup in 2012. Both sisters are members of the 2017-20 USA Basketball Women's National Team. Appel also won gold medals at the 2007 Pan American Games and 2006 FIBA Americas U18 Championship; while Nneka Ogwumike won gold medals at the 2011 World University Games, 2009 FIBA U19 World Cup and 2008 FIBA Americas U18 Championship. More recent Stanford athletes who have competed at the junior level include Erica McCall, a gold medalist at the 2015 World University Games, 2012 FIBA 3x3 U18 World Cup, 2012 FIBA U17 World Cup and 2011 FIBA Americas U16 Championship. Additionally, Vanessa Nygaard served as an assistant coach to the 2017 USA U16 National Team that captured the gold medal and qualified the U.S. for the 2018 FIBA U17 World Cup. 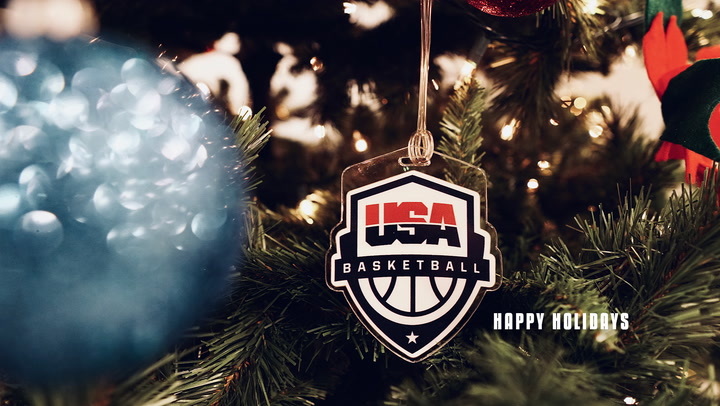 Served on the 2005-08 USA Basketball Women’s Collegiate Committee, assisting in the selection of USA Basketball coaches and athletes for various international events such as the U19 and U21 World Championships and the World University Games. Bronze Medal: 2016 FIBA U17 World Cup. Member of the 2016 USA U17 World Cup Team that finished with a 6-1 slate and the bronze medal in Zaragoza, Spain. Member of the 2017 USA Women’s U23 National Team; averaged 9.3 ppg. and 4.0 rpg. to help the USA claim the inaugural U24 Four Nations Tournament Title with wins over Australia, Canada and Japan in Tokyo. Did You Know ... There have been three players from the University of Texas who have competed on U.S. Olympic teams and seven listing on the all-time USA World Cup Team roster. Clarissa Davis was a member of the bronze-medal winning 1992 U.S. Olympic Team that competed in Barcelona, and Kamie Ethridge and Andrea Lloyd were members of the gold-medal winning 1988 U.S. Olympic Team that competed in Seoul. Winning gold medals at the FIBA World Cup were Edna Campbell (1998); Davis, Ethridge and Fran Harris in 1986; Vicki Hall (1990) and Jackie Swaim (1979); while Lloyd was a member of the bronze medal winning 1994 squad. Also, former UT player Nell Fortner served as the 1997-2000 USA Basketball National Team head coach. While helping the U.S. collect gold at the 1998 World Cup and 2000 Olympic Games, Fortner rolled up an overall 101-14 record at the helm of USA Basketball squads. Longtime head coach Jody Conradt piloted the 1987 USA Pan American Games Team to the gold meal with a 4-0 record. More recent Texas standout Imani Boyette earned a gold medal as a member of the 2010 USA U17 World Cup Team. In addition to Texas players and coaches, current UT Director Women's Athletics/Athletics External Services Chris Plonsky has been on the USA Basketball Board of Directors since 1996, currently serving as the NCAA representative and formerly was Vice President for Women. Additionally, Plonsky was the chair of the 2005-08 USA Basketball Women's Collegiate Committee, which selected players and coaches for various college-aged squads such as the U21 World Championship, U19 World Cup and World University Games teams. Head coach Karin Aston is a member of the USA Basketball Junior National Team Committee, which selects coaches and athletes for USA Basketball college-aged competitions, which include U23 competitions. Current assistant coaches Tina Thompson first competed for USA Basketball at the 1995 World University Games and went on to collect a pair of Olympic gold medals in 2004 and 2008, gold at the 2007 FIBA Americas Championship and a bronze medal at the 2006 FIBA World Cup; while Jamie Carey played on three USA Basketball teams, earning bronze at the 1998 World Youth Games, silver at the 2003 Pan American Games and competed as a member of the 2007 USA National Team during its exhibition slate. Carey also spent four years as the USA Basketball assistant women’s national team director. Gold Medal: 2014 FIBA Americas U16 Championship. Member of the 2017 USA Women’s U23 National Team; started in all three games and averaged 4.0 ppg. and 2.3 rpg. to help the USA claim the inaugural U24 Four Nations Tournament Title with wins over Australia, Canada and Japan in Tokyo. Member of the 2016 USA U18 National Team that finished with a perfect 5-0 record, earned the gold medal at the FIBA Americas U18 Championship in Valdivia, Chile, and qualified for the 2017 FIBA U19 World Cup; averaged 7.2 ppg. and a team fourth-best 6.2 rpg. Honors: 2014 FIBA U17 World Cup All-Tournament Team. Member of the 2017 USA Women's U19 World Cup Team that posted a 6-1 record and finished with the silver medal after losing to Russia by four points in the gold medal game in Udine, Italy; aided the 2017 USA U19 squad to a 3-0 exhibition record against U19 teams from Italy, Latvia and Spain. Took part in the 2015 USA U19 World Cup Team and 2013 USA U16 National Team trials. Member of the 2014 USA U17 World Cup Team that posted a 7-0 record en route to capturing the 2017 FIBA U17 World Cup gold medal in Pilsen, Czech Republic; came off the bench to average a team fourth-best 10.6 ppg. and a team third-best 5.7 rpg. Among all U17 competitors, ranked first for field goal percentage (.519). Helped the 2014 USA U17 squad to a 2-1 exhibition record against Canada, China and France in Nogent Sur Seine, France. Gold Medal: 2017 FIBA 3x3 U18 World Cup. Teamed up with Janelle Bailey, Aquira DeCosta and Christyn Williams to capture the 2017 FIBA 3x3 U18 World Cup with a perfect 7-0 slate in Chengdu, China; scored 32 points (4.6 ppg.). Earned the right to represent the USA at the 2017 FIBA 3x3 U18 World Cup by winning the 2017 USA Basketball 3x3 U18 National Tournament as a member of Bounce Back (7-0); earned tournament MVP honors. Aided the 2017 USA U19 squad to a 3-0 exhibition record against U19 teams from Italy, Latvia and Spain. Participated in the 2014 USA U17 World Cup Team trials. Gold Medal: 2011 FIBA Americas U16 Championship. Member of the 2011 USA U16 National Team that claimed the gold medal with a perfect 5-0 record at the FIBA Americas U16 Championship in Merida, Mexico. Did You Know ... While a number of former Texas A&M athletes competed in several different U.S. Olympic Festivals, former Aggie Kelsey Bone was the first A&M athlete believed to have competed internationally for USA Basketball prior to Courtney Williams, who captured the silver medal at the 2015 Pan American Games. When Bone was still in high school, she helped USA Basketball teams earn gold at the 2008 FIBA Americas U18 Championship and 2009 FIBA U19 World Championship. Further, former A&M head coach Peggy Gillom was an assistant coach for the 2000 U.S. Olympic Team that won the gold medal and 1999 USA Pan American Games Team that returned with bronze. Scored a USA U19 single-game record 31 points in the gold medal game. Did You Know ... While numerous Bruins have donned a USA Basketball uniform in the past, the trio of Denise Curry, Ann Meyers (Drysdale) and Natalie Williams, have represented the United States in four Olympics and six FIBA World Cups. Meyers was a member of the first women’s U.S. Olympic basketball team in 1976 and brought home the silver medal from Montreal. Curry missed her shot at a medal in 1980 after the United States did not participate in the Olympic Games that were held in Moscow. However, four years later Curry and her Olympic teammates collected the USA’s first women’s Olympic basketball gold medal in Los Angeles. Williams helped the USA capture gold at the 2000 Games in Sydney. In World Cup play, Meyers was on a young squad that finished eighth in the ‘75 Worlds in Cali, Colombia. Meyers returned to the 1979 World Cup and, along with Curry, aided the U.S. to a gold medal turnaround in Seoul. The United States, which has medaled in every World Cup since 1979, earned a silver with the help of Curry at the 1983 Worlds in Sao Paulo, Brazil. Williams aided USA Basketball to a pair of gold medals in the 1998 and 2002 FIBA World Cups. In addition to the three Olympic and World Cup team players, legendary former UCLA head coach Billie Jean Moore was an assistant coach for the 1975 USA Worlds squad and returned the following year as head coach of the U.S. team and led the squad to the silver medal in the inaugural Olympic women’s basketball tournament. Additionally, UCLA head coach Cori Close was a court coach during the 2017 USA Basketball Women’s National Team training camp. Member of the 2017 USA Women’s U23 National Team; averaged 5.0 ppg. and 4.3 rpg. to help the USA claim the inaugural U24 Four Nations Tournament Title with wins over Australia, Canada and Japan in Tokyo. Took part in the 2014 USA Basketball Women’s U18 National Team Trials. Gold Medal: 2014 FIBA U17 World Cup. Gold Medal: 2015 World University Games, 2011 FIBA Americas U16 Championship. Member of the 2017 USA Women’s U23 National Team; averaged 7.0 ppg., 3.3 rpg. and 4.0 apg. to help the USA claim the inaugural U24 Four Nations Tournament Title with wins over Australia, Canada and Japan in Tokyo. Member of the 2015 USA U16 National Team that captured the bronze medal with a 4-1 record in Pueblo, Mexico; started two of four games and averaged a team fourth-best 6.3 rpg.